1. Position a rack in the center of the oven and preheat the oven to 325 degrees F. Grease the inside of a 10-inch Bundt pan. Dust with flour. 2. Sift the flours, cocoa powder, baking powder, and salt into a medium bowl. Set aside. 3. In a bowl of an electric mixer, using the paddle attachment, beat the butter at medium speed until very creamy, about 2 minutes. Gradually beat in the sugar. Increase the speed to medium-high and beat until the mixture is well-blended and light, about 4 minutes. At medium speed, beat in the eggs one at a time, mixing well after each addition and scraping down the sides of the bowl as necessary. 4. In a small bowl, stir the vanilla extract into the sour cream. If your mixer has a splatter shield attachment, attach it now. At the low speed, add the dry ingredients to the butter mixture in 3 additions, alternating with the sour cream mixture in 2 additions and mixing just until blended. Scrape the batter into the prepared pan and smooth the top. 5. Bake the cake for 65 to 75 minutes, until a cake tester inserted into the center comes out clean. 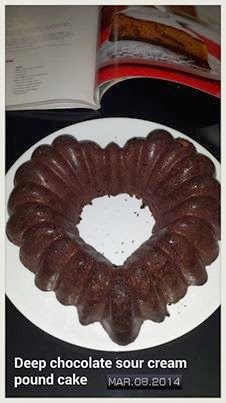 Cool the cake in the pan on a wire rack for 15 minutes. Then invert the cake onto the rack and let it cool completely.